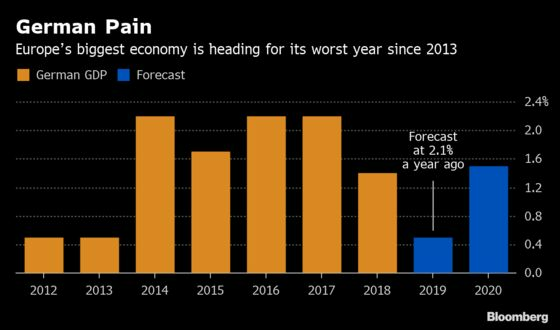 The German economy is turning into Europe’s underperformer, with the government now predicting 2019 will see the weakest expansion in six years. Amid slowing global momentum and concerns over Brexit and trade disputes, the economy ministry on Wednesday cut its estimate to 0.5 percent, half the pace previously forecast. It’s the latest in a series of downward revisions from a 2.1 percent projection a year ago. Growth for next year is seen at 1.5 percent. While there’s been a small improvement in business confidence, manufacturing in Germany remains mired in a deep slump. 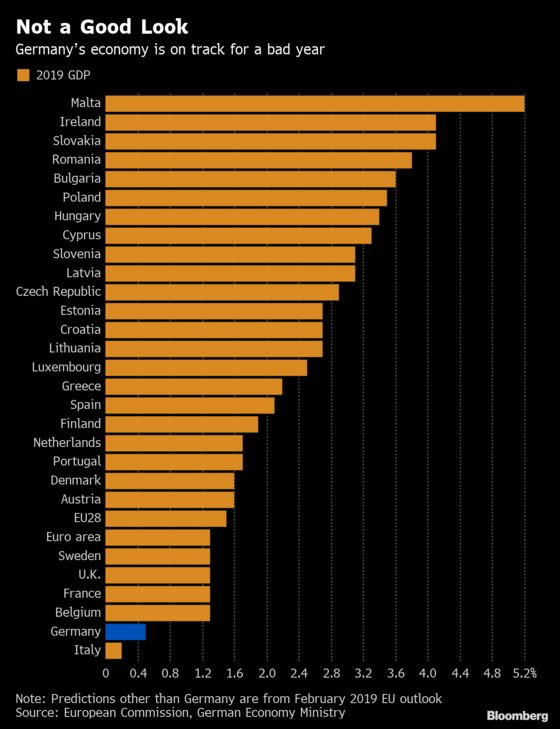 Based on European Commission forecasts for the rest of the euro area, the government’s latest prediction would leave Germany as the region’s worst performer this year, bar Italy, which is stagnating. The extent of the slowdown has prompted appeals for Germany to use its financial cushion to boost spending. Altmaier said Germany is investing into infrastructure, education and research at record levels. The chancellor’s spokesman, Steffen Seibert, earlier this week denied the need for a package of measures to boost growth.